Home > Campus News > Key to Corporate Success! 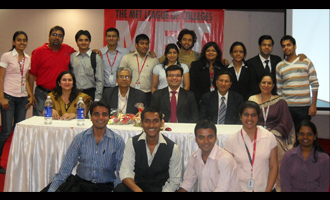 MET Schools of Management organized guest lecture on ‘Practical Wisdom for Corporate Career’ by Mr. Dinesh Sharma, Marketing & Operations Head, Samsung CDMA Mobiles Division on Jan 30, 2010 at the MET Convention Centre. The lecture was well attended by a large audience of more than 200 students besides faculty and staff members.